You don't come across this type of situation every day. We were strolling Indian Beach in North Sydney on Sunday just before dusk, something we do from time to time. Interesting things wash up there - odd pieces of metal, sea glass, large swirly shells. I didn't expect to run across this; a whale had found itself trapped in shallow water at the shore. What to do? I had heard there was a helpline to help beached marine mammals. I did some searching on my phone and couldn't find anything. Beside myself, I took a bit more of a look and found that the whale was in a very precarious part of the beach, with sharp jagged rocks. It was flapping around frantic. And there was blood. A good citizen joined us at the time, as did a Karen Steele who called a helpline. We went into the water to see what might be possible. Saying the whale was heavy is an understatement, and it was difficult to grip. 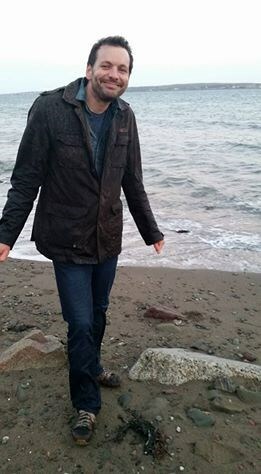 I tried to move as many of the sharp rocks away, but there were some really large ones that just weren't moving. The only option I could see was to move it backwards or to the right where it seemed more sandy. Backwards was hopeless. The whale’s large tail and sheer weight made any efforts to move that way impossible. To the right we went. We managed to get it turned around a bit, enough that it could move itself completely around and eventually into open water. After all of this I had mixed feelings. 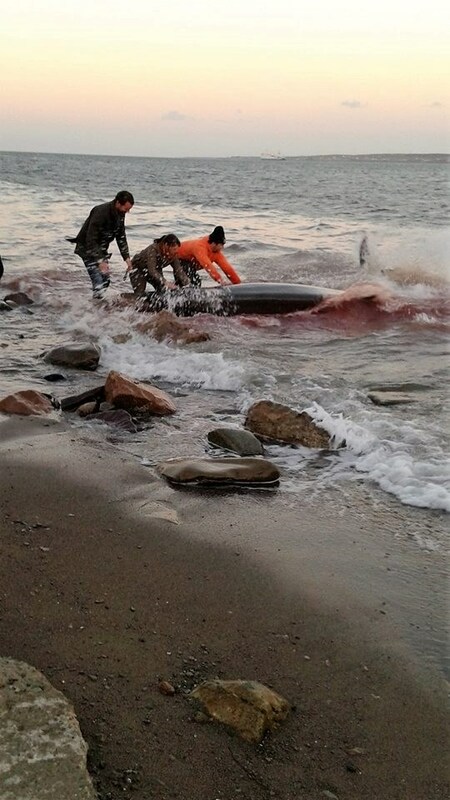 It was such a relief to see the whale return to the sea by way of its own power, but the blood made me wonder if it would survive. 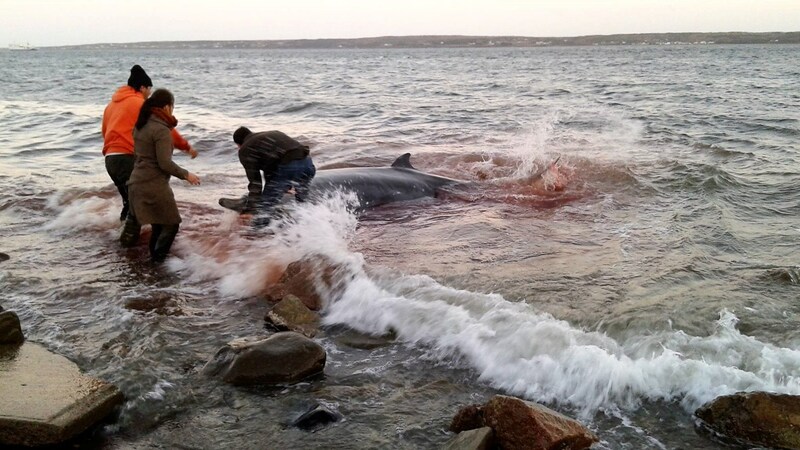 There were scrapes from the rocks, and it is never a good sign when a whale washes up on shore. I was curious when I got home completely drenched from head to toe. Was it a dolphin? A whale? Who knows. Sowerby's usually inhabit deep waters (greater than 500m) and are susceptible to a number of threats, including seismic activity, pollution and development. They are found along our Atlantic coastline but usually much farther out, and I couldn't find any records of them being washed up or even sited near Nova Scotia (besides Sable Island). In fact, the map in the recovery plan shows only 17 strandings or entanglements in Atlantic Canada since 1952. I wanted to mention that it is not advisable to get close to such a powerful animal that can break bones, especially when navigating slippery rocks. I was very careful as to not get close to that powerful tail. The video proves it! You should always call the Marine Animal Response Society (1-866-567-6277) for beached marine mammals and it is advisable not to engage them as to not cause further harm for them or for you. They have volunteers and training in these sorts of things. I just found myself in a situation that I felt was life or death for the whale. I wanted to acknowledge Karen Steele for her picture and video footage of the event. Soaken wet but worth it. The whale gave me a big tail splash for good measure as it made for the open water. Fingers crossed that it will be okay. 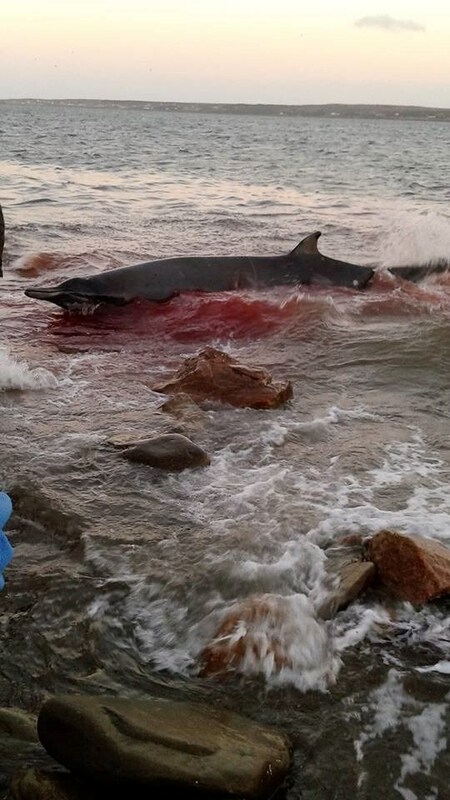 Rare Sowerby's beaked whale washes up in North Sydney. See the dramatic rescue. Great job, Chris! Thanks for helping the whale and also for sharing your story. The help line is great info too! Great article Chris and thanks for the Sowerby's Beaked Whale research information that you included! Great effort on your part; especially given the pecarious status is this species! Definitely worth a shot to give it a chance. Unfortunately, there are three reasons to think this amazing animal will not survive. 1) as you indicated it is a deep water whale so it is unlikely it just wondered off course. It quite likely was sick in some manner already and was going somewhere away from its pod to die and not attract predators. And 2) More dangerous to an animal of this size than a few few scrapes or even gashes, is whales are normally buoyant and when beached the crushing weight of itself on its internal organs is quite often fatal within a day or two. Or 3) Yhe release of extreme stress hormones essentially poison the animal in the hours following the stranding.